For most of my tea reviews I use a white teacup, or sometimes clear glass. If I'm drinking tea alone I use one of my cups that are the same volume as my brewing vessels so I can just pour my brews directly into the cup without using a cha hai. A white teacup is perfect for showing the color of the tea liquor, and if you don't use a strainer and get some small leaf pieces in the cup you can easily judge the clarity of the liquor. However, none of these white cups are my favorite teacup. My favorite teacup doesn't end up in photos very often because it's one I use when I'm simply drinking tea for myself, for pure enjoyment. So I decided that my favorite cup itself deserves to be in the spotlight today. This cup came from an American artist who sells teaware on his Etsy store "NoirDragon." 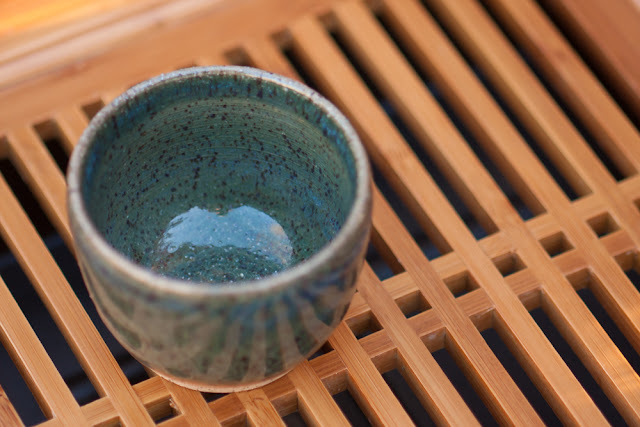 One interesting thing about NoirDragon is that his path to producing beautiful ceramic teaware is completely rooted in his passion for tea. His passion for tea naturally lead him to appreciate and collect teaware, and then eventually he decided to learn more about the art of pottery so that he could create his own teaware. And now he is sharing his creations with fellow tea lovers. 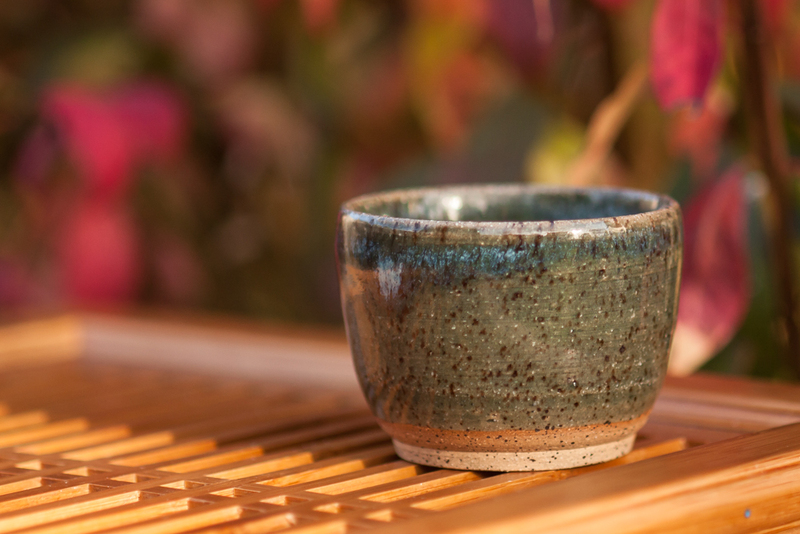 NoirDragon has used a beautiful stoneware clay for this cup and left a band of unglazed clay at the outer bottom edge to show off both the color and texture of this clay. The quality of my NoirDragon cup shows very precise craftsmanship and attention to detail. I can turn this cup over and set it on a flat surface and the rim is perfectly even and the base is perfectly level. I discovered this by chance while trying to photograph the bottom of the cup and was very impressed with the geometric perfection. I'm really happy with the glaze/color of this cup. The inside has a slight blue hue to it, and the outside has a bit more green. I used to say that I don't have a favorite color because all colors can be great depending on context, but despite that, I do admit that I tend to gravitate toward green, and I absolutely love the color of this cup. At first I assumed that the speckled pattern on this cup was due to the glaze used, but when I asked the artist about it, NoirDragon told me that the speckles are actually due to manganese granules in the clay itself that produce this beautiful pattern through the glaze when fired in the kiln. If white glaze is applied to this clay, it will show up as little brown speckles on the white glaze which also has an interesting effect. 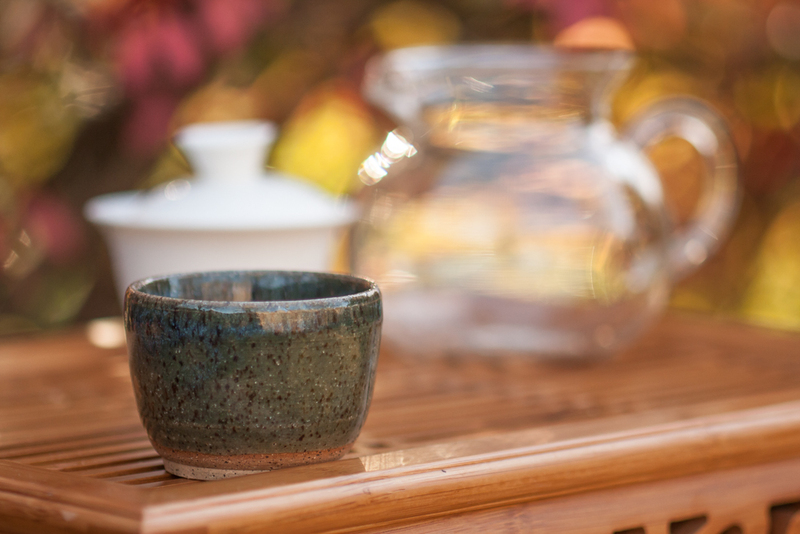 This has easily become my favorite cup for more than just the appearance and craftsmanship as it functions very well for my typical personal tea brewing sessions. True, it doesn't have a white interior so it doesn't show off the tea liquor, but adding a glass cha hai would take care of that if needed. I really love this cup though because it is the perfect volume for holding the contents of an 80ml gaiwan. The 80ml gaiwan is the brewing vessel I use about 85% of the time I brew tea, and I can pour directly into this cup and it fills it to the top. 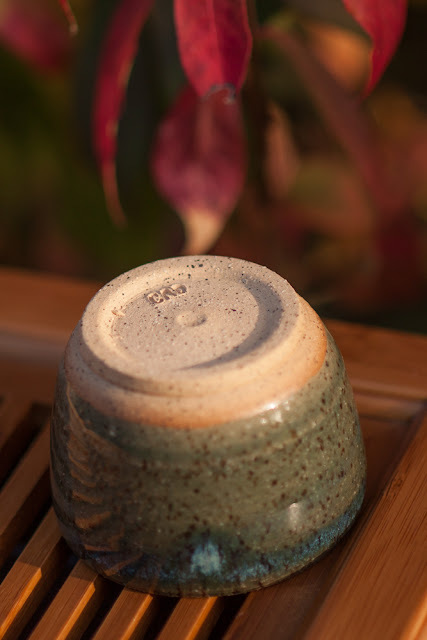 The clay is thick enough to keep my hands from getting too hot, and once preheated, that thickness holds in heat well to keep the tea warm as I sip. The size, shape, and weight of the cup feels perfect and natural in the hand. Drinking from this cup allows me to have a better connection with the tea and I'm able to enjoy the tea without being distracted by an uncomfortable or awkward cup. NoirDragon's creations are continually evolving, and I really look forward to seeing what he comes up with next. Through recent conversations I have learned that he often tries out new glazes and clays. He has some pieces that have a crackle glaze, and a few that have a really interesting highly textured "crawl glaze" that look like they were crafted directly from parched earth. I have also heard that he is experimenting with brewing vessel designs such as shiboridashis and possibly gaiwans, and I think he may even be trying out some tea pet designs! So you may not see this cup make an appearance too often in my tea reviews, but if you stop by when I'm having an enjoyable tea session with my favorite teas, there's a real good chance that I'll be sipping from my favorite teacup.